Cook shrimp and set aside. 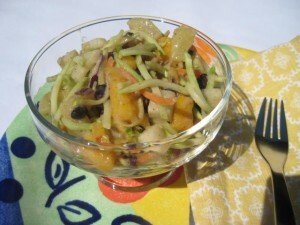 In a large bowl combine the black beans, pineapple, chopped mango, jicama and slaw. Toss well and set aside. In a smaller bowl combine the remaining ingredients and blend well. Pour this dressing over the slaw mixture. Toss until slaw is coated. Refrigerate the slaw salad for at least one hour. You have a couple of options. 2) leave the shrimp whole and arrange one shrimp on the top of plated salad. I personally like to leave the shrimp whole. It makes for a nice arrangement. This recipe will make 8 servings. Each serving is in the neighborhood of 160 calories when serving with one jumbo shrimp. Print recipe using your printer menu options.